being MVP: Super Duper Publications: Pirate Talk Board Game, Hear Builder Auditory Memory Software CD + MagneTalk Match Up Adventure Kit & Giveaway! Super Duper Publications: Pirate Talk Board Game, Hear Builder Auditory Memory Software CD + MagneTalk Match Up Adventure Kit & Giveaway! Pirate Talk comes with an electronic spinner rather than a traditional spinner, which my daughter was really excited about. She sometimes has trouble spinning those little plastic spinning wheels that most board games come with. The electronic spinner was perfect for her because she could just push a button and watch the lights spin around. I appreciated the fact that the spinner has a switch to turn the sound on/ off, for those of us who prefer to use it with just the lights. This game didn’t really work as well with me being one of the players. With the way the game is formatted, I think it works best with the adult being the facilitator and at least two children as players. The grown up is the one reading all the questions. The game didn’t really seem to have an ending to it, or a certain goal that players were trying to achieve. The instructions said that the game was over when time runs out or when you run out of gold coins. But we found a variation that we liked. The directions include a few different options for game variations, and we played a version where players pooled all the gold coins they earned in the middle of the game board, rather than collecting the doubloons themselves individually. Then at the end of the game, the winner wins the whole pot! Another variation that I want to try is called Digging for Gold, where you bury the doubloons in a container of sand and let your child dig them up. Pirate Talk would be ideal for a teacher or therapist doing a small group activity with a few children. 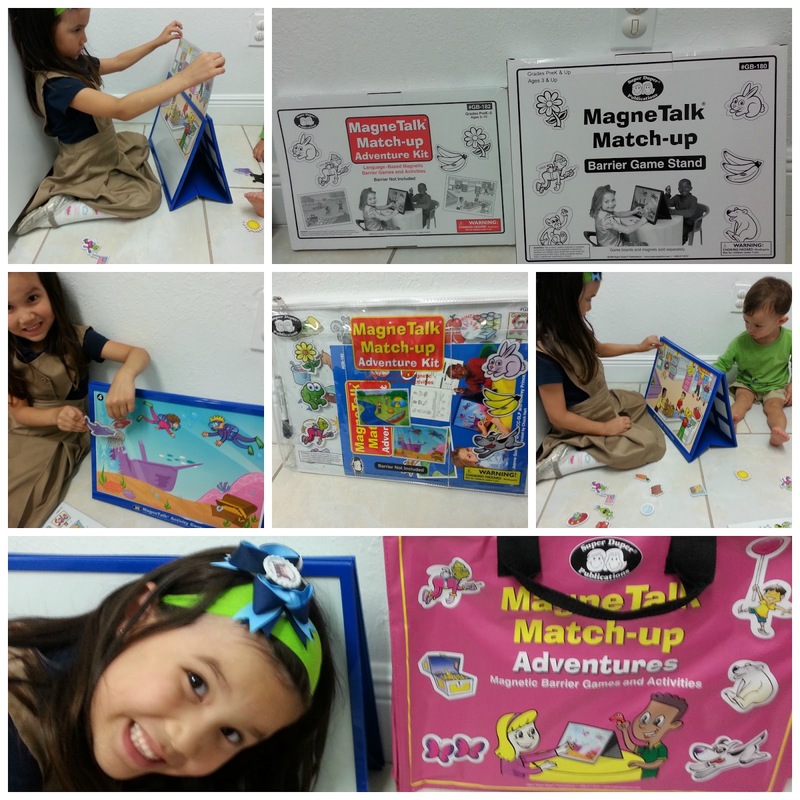 The second product we received was the MagneTalk Match Up Adventures Kit which came in several parts. It is designed for grades Pre-K - 5. 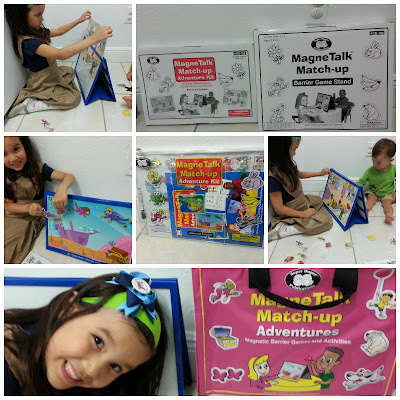 The MagneTalk Barrier Game Stand is a 12” x 16” magnet board that is double sided so that two children can use it simultaneously. They cannot see each other’s magnet creation, and children can compare their scenes when finished designing it. The kit comes with ten board inserts with five different scenes: camping, space, undersea, park/picnic, and grocery store. We received 100 magnets, ten that go with each of the scenes. 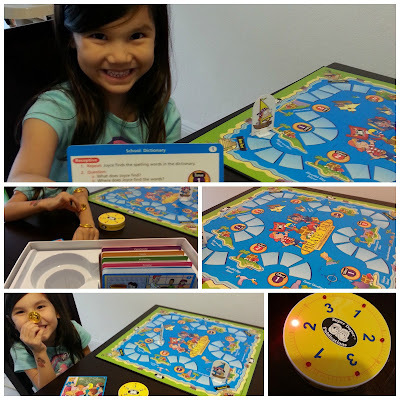 For example, the undersea insert has corresponding magnets such as fish and the space board comes with magnets such as an alien that my daughter had fun using to decorate her picture. This would be a perfect activity for a teacher or therapist to use to work on following directions or storytelling. I want my daughter to work on storytelling / oral language, to improve her skills with speaking in class when the teacher asks them to share something they've written in their journals. There are many other skills that this product focuses on such as listening and vocabulary which I could see being valuable for English language learners. The magnet board is also a dry erase board, but my daughter was disappointed to discover that the marker it came with was already dried up! We also received a 34 page reproducible activity book with CD-ROM that teachers can use to print materials from. It was nice that the board was double-sided, so little brother could feel like he was participating in the activity on his own, without disturbing my daughter’s picture. The final product that we received was a Hear Builder Auditory Memory CD. My daughter is really excited about using the computer lately, so I thought this would be the perfect thing to motivate her. The CD is designed for 1-4 players, for ages 5 & up, or grades K-8. She loved the games and activities. The first night she used it, she was crying when I told her it was time to go to bed because she wanted to “keep playing the game.” The CD includes activities that reinforce listening skills, such as a game where they display pictures of three items. The child hears an auditory list of the three items and then has to remember the order and click on them in the correct order. Then the game moves on to a more difficult task where there are six objects displayed but only three are used. This game would be perfect for a therapist to use with a small group of children. Another activity my daughter really liked was one where it shows a picture of several children and the directions would ask you to click on the child wearing glasses, or click on the boy wearing long pants, etc. 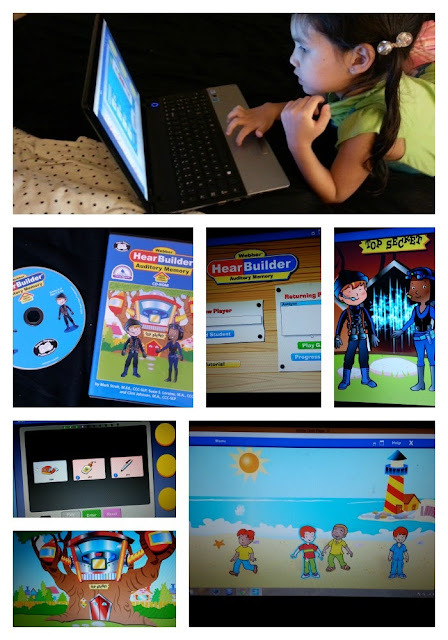 The award winning Hear Builder Auditory Memory Software Program Home CD is very helpful to my daughter since she is developing number and letter / word recognition. When she is looking at the pictures of different objects, they are always labeled with a word underneath so she can become familiar with the spellings of the words. She really liked one of the numbers games, where secret agents have a mission to type in the secret code. The game plays an auditory message with a secret of numbers. Your child has to listen and remember the order of the three numbers and then type in the code on a number panel which resembles a calculator. These activities are particularly helpful to my daughter right now since she is just learning how to read. She can even play with a friend if she has a friend over. And the best part is she just feels like she’s playing a game, not doing something educational. I would recommend this CD to any teachers or parents looking to focus on listening skills and vocabulary or to build memory and work on word recognition. 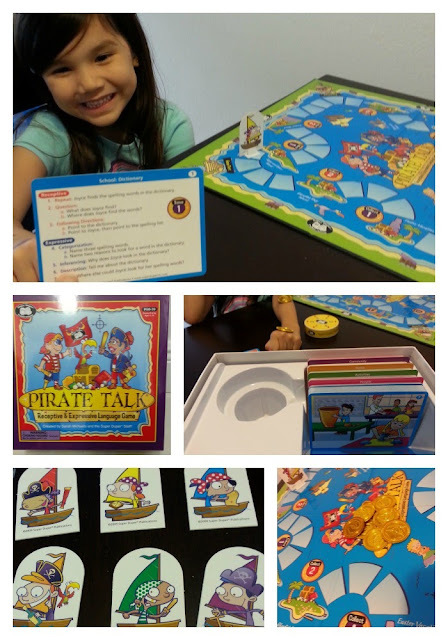 Buy It: You can purchase the Pirate Talk Board Game for $54.95, Hear Builder Auditory Memory Software CD for $69.95, MagneTalk Match Up Adventure Kit for $89.94. Make sure to connect with Super Duper Publications on Facebook, Twitter, Youtube and Pinterest! I love how they have so many different games and learning methods to teach children of different learning styles! I love the just for laughs game! The Ask & Answer Bingo looks fun! I learned that for 27 years, Super Duper Publications has been making hundreds of creative, colorful educational and therapy materials that you and your children will love. I learned that they offer a bunch of free learning apps. I learned they are housed in their Super Duper Castle and they offer tours of it! I would love to tour it! I learned that they have free shipping! Thanks so much for the fantastic giveaway! I love this company! I have ordered from them before and love their return policy! I learned that they offer a wide variety of products that are essentially teaching aids. The company was founded in 1986 with 2 products and 2 stickers. I learned they have lots of great products and they have great prices on the deals of the week links. I learned they have lots of free handouts...for parents and teachers! Love that they cater to different learning styles. I love that they have one app on sale every day! I learned that they have free handy handouts. I learned that they have so many educational games and free shipping. I learned that regular shipping is free with a $20 minimum order! I learned that they offer conferences as well.